But even if our perception of how many students are smoking e-cigs is off, that doesn’t mean they’re not a problem. According to the 2013–2014 National Adult Tobacco Survey, 14 percent of young adults (ages 18–24) are using e-cigarettes as are 6 percent of those 25 and older. 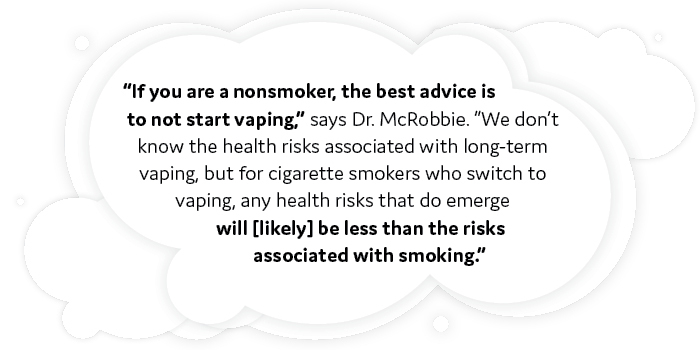 Vaping is widely thought to be safer than smoking, but that doesn’t mean it’s risk-free, says Dr. Hayden McRobbie, professor and researcher in the Tobacco Dependence Research Unit at the Wolfson Institute of Preventive Medicine at Queen Mary University of London. 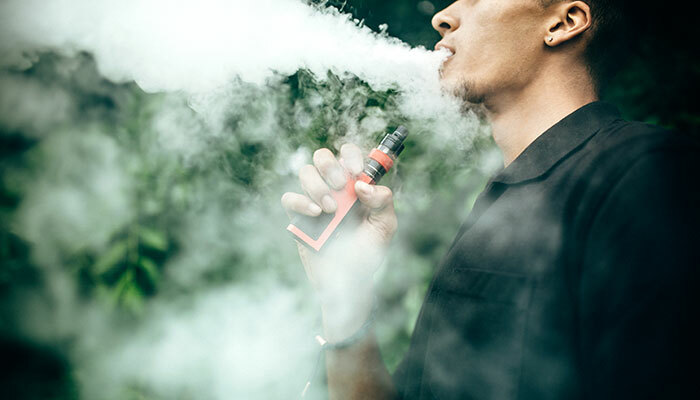 Many e-cig products contain nicotine, which is highly addictive and has been shown to harm the developing brain of young adults, according to the surgeon general. The US Food and Drug Administration (FDA) has also found a number of cancer-causing chemicals in vaping products. “There are many models of e-cigarettes and vaporizers, including homemade products,” says Dr. Jean-Francois Etter, professor of public health at the Faculty of Medicine of the University of Geneva in Switzerland and an expert in tobacco dependence. Little-known fact #1: There are more than 460 different e-cigs on the market today. Little-known fact #2: They’re so varied—from the number of puffs to the types of liquids to the depth of inhalation—that it’s difficult to assess their risk, Dr. Etter says. Anything that can help you take strides towards ridding yourself of a bad habit is useful! In particular, the tips and quotes offered were a really great way to make you start to think differently about smoking. When is breaking bad habits ever fun? Oh right, when you get to play games instead (or at least, while you’re working through the tough part)! In all honesty, I thought this feature was the greatest part of the app: both fun and helpful. You need to be proactive and consistent with checking back in order to reap the full benefits of the app. While I didn’t completely quit smoking based solely on this app, it certainly put me on the track to do so, and allowed me to make better use of my time and money. Baby steps, right? Brownson, E. G., Thompson, C. M., Goldsberry, S., Chong, J. H., Friedrich, J. 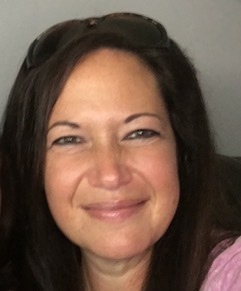 B.
Polosa, R. (2015). Electronic cigarette use and harm reversal: Emerging evidence in the lung.